Add a little holiday charm to any room with this festive lantern. Light up the harvest holiday decorating with this lantern with floral accessories and lights. Add easy illumination and a bit of sparkle to any room with this festive lantern. Easily add accent lighting for your patio or garden with the beautiful blown glass lantern. It contains 12 bright firefly LEDs. The metal handle allows for easy carrying. The lantern may be used for table top decor or hanging accent lighting. The solar panel charges automatically in the sun. Lighting turns on at dusk and automatically turns off at dawn. Enhance the season with this set of 4 LED tea light candles. These orange plastic, LED super bright tealights are perfect use with lanterns or in groupings to create enchanting displays all around your home. They are battery-powered and are a safe alternative to candles. Each tealight includes a CR2032 battery. It's amazing how this animal head mask will transform you into looking like a real animal ! With a thoroughly detailed design, this mask is high quality and looks super realistic. The fact that the mouth actually moves with your lower jaw, creates any even more awesome illusion. Let your inner animal loose and be animalistic this trick-or-treat season.! 12-inch Lantern with Lights Harvest or Halloween Decoration Add a little holiday charm to any room with this festive lantern. 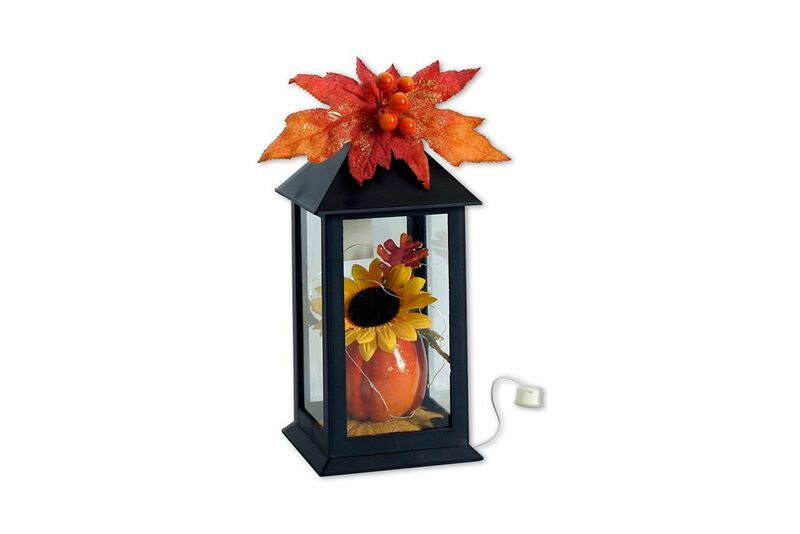 Light up the harvest holiday decorating with this lantern with floral accessories and lights.